At Penzance’s Blue Seas Hotel you will find a comfortable bed & breakfast accommodation, friendly service and excellent food. This elegant grade II listed guest house, set in a south-facing Regency terrace, is ideally located for visitors to West Cornwall. 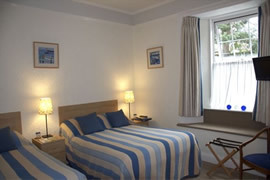 Overlooking Mount’s Bay, most of the rooms have a stunning sea view towards Newlyn and Mousehole. We now provide a free wireless broadband internet connection throughout the hotel with free use of laptop. The hotel has its own large private car park. The well known breakfast has been awarded the AA egg cup in 2002. The Duporth Hotel is proud to use products which are either home made (bread, jams..) or bought locally from the best Cornish producers (egg, sausages, cheeses, bacon).